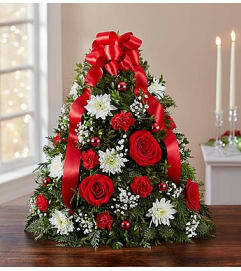 We’ve decked out our best selling bouquet for the holiday season. 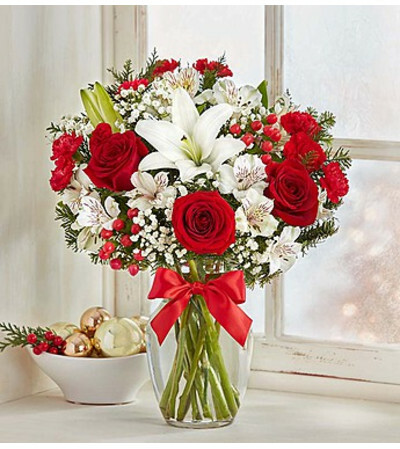 This classic, arrangement is hand-designed in a glass vase by our expert florists using the freshest red roses, white lilies, carnations and fragrant assorted greens. Wrapped up with a joyful red ribbon, it’s a gift that delivers your warmest wishes for a winter filled with smiles. So whether they’ve experienced the beauty of Tuscany or Provence firsthand, or they’re simply filled with a sense of wanderlust, someone special will be transported to Europe for the holiday! 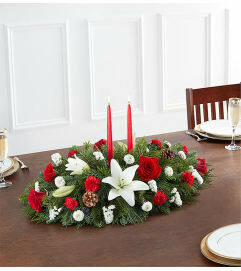 Fresh and festive arrangement of red roses, white lilies, alstroemeria, mini carnations, hypericum and mixed Christmas greens. Standard arrangement does not include lilies or hypericum.